Collect your incoming mails in these sturdily constructed private post boxes. 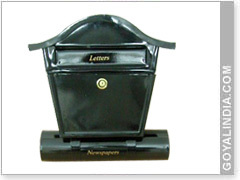 Goyal India has brought forth this range of private letter boxes for being installed in the garden or near the entrance gate of your villa. Easy to install, these post boxes are available in black and red colors and they can hold A4 size magazines. 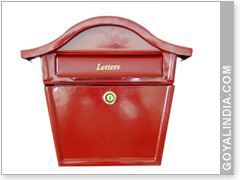 Fitted with in built lock system, these post boxes have been manufactured from splash, weather, rust & termite proof metal for full security of your precious post.Our offerings include locking mail boxes, garden post box, red post box, black post box, antique post box, post office boxes, post office box etc.